Karadaiyan Nombu is a festival celebrated by South Indian married women in Tamil Nadu. North Indian women have a similar festival called Karva Chauth. The premise is that married women pray to never be separated from their husbands. The story of Savithri's devotion to her husband Sathyavan is remembered that day, you can read about it here. I have a younger sister named Savithri, so we were quite familiar with it growing up, and we loved reading the romantic story in the Amar Chitra Katha comic books. For Karadaiyan Nombu, I called up my dear M-in-law to find out what exactly I was supposed to do. I took down notes and emailed them to her to double check. I never claimed to be a big Thamizh Pullavar, I can barely speak the language but what ensued had my M-in-law in stitches. 1. Wash your hair, and wear a madisaar (nine yards saree). 2. Do not eat leftovers. 3. Make both sweet and savory Adai/Kozhakattai. 4. Make a kolam in front of swami. 5. Place the manja charadu (yellow string), fruits, and butter in front of swami. 6. Tie the first charadu on Devi, with flowers or fresh manjal. "Urukaatha venaiyum, Oradaiyum, naan noothEn, Orukaalum yen kanavan thiriyavendam". 8. Serve the Kozhakattai as neiveythiyam to god. 9. Do a namaskaram for Shankar, and give the neiveythiyam to shankar. Wednesday evening b/w 7:30 - 9:30. Well, the joke was in line 7. where the Thamizh saying is supposed to be: "Non-melted butter, an adai, I place in front of you, at anytime my husband should not be parted from me (Piriyavendam)." Instead I have written for the last part: "At anytime, my husband should not be out roaming around! (Thiriyavendam!!)". Here is a Thamizh version: "உருகாத வெண்ணையும் ஓர் அடையும் வைத்தேன், ஒரு காலும் என் கணவர் என்னைவிட்டு பிரியாமல் இருக்க வேண்டும்". ( O Lord. I pray that my husband leads a long life and stays with me forever.) It is almost the same as what my M-in-law mailed me. Luckily for me my mother was visiting from Toronto, so the two of us had the laptop open and diligently followed the instructions. Also my organized mother made sure to bring soaked black eyed peas with her, and also manjal. 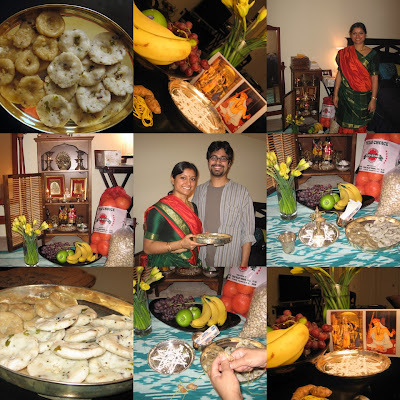 The adai turned out nicely thanks to my mom, and we did our puja together. Luckily for me my hubby is such a sweet fellow, and he made us a delicious lemon rasam for dinner which we served up with beans curry, and a green pepper mushroom curry that my dad made! So the women were praying, and the men did the cooking! A nice modern twist on Karadaiyan Nombu. If one had to compare Shankar and I cooking nice dishes for our respective in-laws I do think my folks got the better end of the deal! Below are the recipes straight from Chennai courtesy of my mamiyar. 2. Boil 2 cups of water with the jaggery, black eyed beans & coconut bits, & cardamom powder. Once the jaggery has melted completely add the flour. Reduce the heat & mix & cook till the water is gone. 3. Let it cool for some time so that you can roll it without getting blisters. Roll them into balls, flatten them and make a hole in the middle. 4. Steam them in an idly steamer for 10 minutes or so. 1. Splutter mustard seeds, add green chillies & ginger, curry leaves, coconut bits and the black eyed beans. 2. Add 2 cups water, salt. 3. When the water starts boiling add the flour and continue as you would in the previous recipe. Verdict: I don't think the men were really all that into the Adai's that we made for them but Mom and I certainly enjoyed them! Shankar's rasam was the hit of the night, and his secret ingredient was to add a stalk of lemongrass that was left in our fridge from the Thai cooking. Hey Kanchana! I certify that your vella adai and uppadais were good because I have tasted them! You should thank your mother in law for the best recepie. Hi Kanchana,look at you!You are doing all that what our grandmothers used to do! :)) Good job,dishes look great and approval fro your dad too.Enjoy sweetie. Thank Gomathy for a flawless step by step instruction in making fabulous tasting adaigal. With a daughter named Savithri it is extra special to observe this nombu. Another chance to get decked out in the nine yards! Lovely...! You look beautiful in that traditional sari. Nice info. on this tradition. Hi Kanchana, first time in your blog. You look good in the madisar sari. I saw similar article about this nombu in Ammupatti's blog I suppose. The Adai and Uppadis look so yummy. oh forgot to ask is it Kozhukattai with hole? Kanchana, Lovely post. I am linking this to mine. My name is Birundha from Kumbakonam, India. I live in colorado springs from past 4 years, before that I lived in West Bloomfied, MI for 5 years. I had a chance to visit your blog today as I was looking for some recipes. Your madisar in nombu was too good. As you were broughtup in CA, I wonder how did you learn to wear madisar. I still struggle in some steps, had to call each time either my MIL or mom back in India. Very nice color saree and you look pretty in that. So are you working in MI? Your blog looks very good. If you ever wants to contact me my email is ambr50@yahoo.com. You are a very pretty lady! You have excellent recipes on your blog. Thanks for all the recipes. I got the cupboard from Target a few years ago. They were selling in the bath accessories dept, I guess its intended to house towels etc! What a lovely post. I found yoru blog a few days ago (while searching for pongal recipes) and have been hooked to it very since. You have a lovely family :) God bless! HI the post is good, do you mind telling me how did you manage to tie a madisar saree. can you show me or describe the steps.. This is Srividya Aunty from Oakville. To my surprise when I was just googling I found your blog.Fantastic! very interesting description.i learnt a lot from it.can u tell me what is karadaiyan?on 14 march i will prepare the adais as u have taught.thanks a lot. Lovely Madisar and adai :) was ROFL reading ur mistake on the sloka :) have a great nonbu this year too!! Nice blog. But that is one thing that in incorrect in your recipe. Karaadai - as the name says is made with karamani payaru and not black eye peas. Karamani must be soaked over night and then used while making the adai. Thanks a lot for the recipe. Very helpful website!